Building instructions and graphics for creating you very own Tower of Lodin: Papercraft Dice Tower. 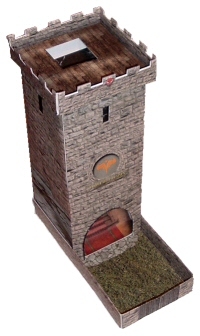 Although made out of standard card stock, this tower is sturdy in construction and will last you for many battles. The building is pretty self-explanatory but if you have any questions about the assembly please feel free to PM me. Enjoy. For more battlefields, resources, etc. check out my thread: AliasQTip's Exclusive Battlefields. June 20th, 2009 at 12:15 AM How long did it take you 2 create this dice tower? June 20th, 2009 at 12:05 PM [quote=notquitehip31][B]1) [/B]How long did it take you 2 create this dice tower? [B]1)[/B] Design - 10 minutes, maybe. Drawing panels, collecting images, rescaling/tiling images - DAYS! [B]2) [/B]I only ever made one. November 12th, 2009 at 07:05 PM Awesome! I assembled one and liked it so much that I built another! December 31st, 2009 at 01:29 AM I love the design! I'm assembling it now so I have it ready for D&D day in January. Thanks for making it available. Tissue paper (for small enclosed sections) or crumpled newspaper (for large) makes excellent reinforcement to prolong the life of your work. February 18th, 2010 at 02:33 PM I had no idea this thing would be this popular. Thanks for all the downloads! September 2nd, 2010 at 05:35 PM Can this tower be made comepletely with paper? May 18th, 2010 at 06:31 AM Would just like to add that I downloaded this and I have made 3 of these in just the past day or so (and plan to make a few more.) Works very well and is surprisingly sturdy to be just card stock. EXCELLENT work! Thanks so much for sharing this with us. August 18th, 2010 at 11:22 AM Excellent! I built my first one last night. Very accurate pieces, fits together well, fairly easy to build. VERY COOL Accessory. If you have not downloaded and built one it is worth the time and effort. June 6th, 2015 at 03:08 AM hate to necro a thread but I love this tower and have had it for a couple of years now. I just finished creating it in 3D for anyone who has access to a 3D printer. I like having it in a more permanent status in gray PLA.